We teach west of the city to include Balmain, Birchgrove, Leichhardt, Abbotsford, up to Gladesville and as far west as Strathfield. Need help learning to swim? Do you have a pool and not enough time to take the kids to swimming lessons? Tanya’s Tadpoles offers swimming lessons in the Inner West in your own pool. 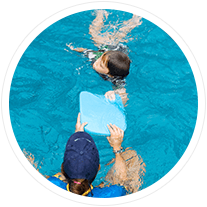 From infant aquatics to stroke development up to junior squad level and adult classes, our programs are conducted by AustSwim and Swim Australia qualified instructors who are trained to provide care and quality teaching. Our aim is to produce stronger and more confident swimmers. 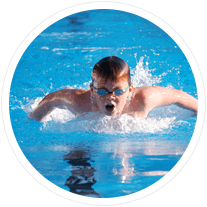 We do this by conducting the swimming lessons right in your own home pool, where your children are most comfortable. This ensures a relaxed environment conducive to learning, which is especially important for young swimmers, including babies and toddlers. We focus on water safety and teaching kids a love of swimming and being in the water – we like our lessons to be fun for all involved. We work on developing swimming skills in all 4 strokes, and we believe teaching correct technique and forming good habits is fundamentally important in children’s swimming lessons.